I’ve spent nearly a week in the Napa Valley working on the Bouchon Bakery Cookbook. This will be the fifth book in a series led by Thomas Keller that began with The French Laundry Cookbook which is one of the best chef-restaurant cookbooks ever (do we need full dislosure here?). Forget the words I write—these books are truly fine and costly productions, and I think it’s important for people to know what goes into books of this magnitude, because so often people don’t know. A team of people, from the many at Artisan, an imprint of Workman Publishing, who make beautiful books, to the commis at the restaurants who scale out the mise en place for the recipes for the chefs, and all those in between, including myself. In 1997, I flew out here to have dinner at the French Laundry and meet Chef Keller, who wanted to write a book. I’d just finished writing Making of a Chef, but was completely unknown in the food world. And I know everyone who’s been integral to all the books feels as I do—we’re really lucky to be a part of them. The photographer Deborah Jones; writer, cook, and tester Amy Vogler; Chef, of course; Susie Heller, who’s not only one of the writers and testers but who is the conductor of the team; and the restaurant chefs Jeff Cerciello, Corey Lee, Jonathan Benno, Sebastien Rouxel, Dave Cruz, and all the chefs they relied on. In an effort to acknowledge the team nature of the books, I’m posting a few pix from my spot within the scenes of The Bouchon Bakery Cookbook. 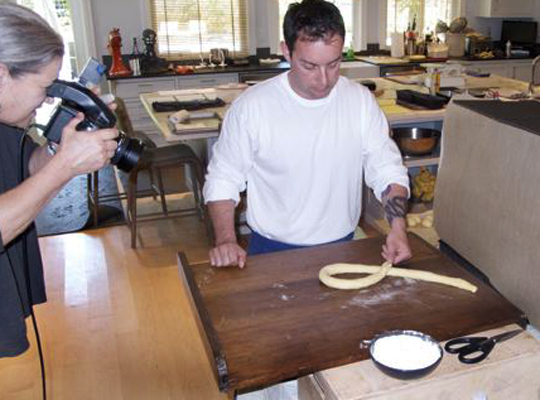 While the primary author and force along with Keller is Bouchon Bakery executive chef Sebastien Rouxel, a substantial piece of the program is bread baking, and Matthew McDonald is the bread guru here. 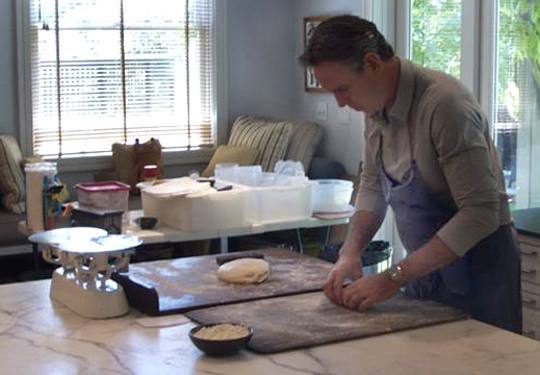 It was my work this week to understand bread baking so that I can write about it from Chef Matt’s vantage point. And on behalf of the book, it was Matt’s job not only to bake bread for the photography scheduled but to teach me what he knows so that I and Amy and Susie can write it. There’s a madness in the impossible quest to bake the perfect baguette, that universally adored, infinitely nuanced combination of flour, water, yeast, and salt. Great bread is an extraordinary balancing act. I spent my first day here, just watching Matt work and asking him questions (how lucky is that?). Baguettes hot out of the oven; these are about as good as baguettes get in America (or France for that matter). 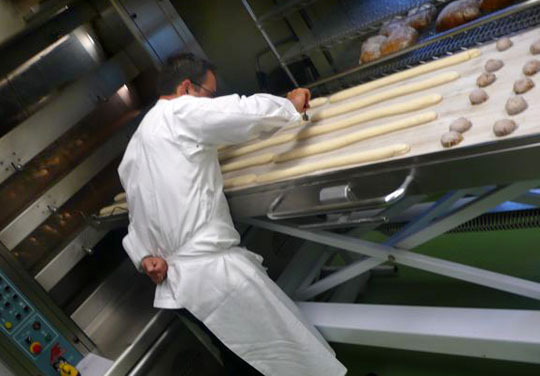 Finished baguettes, a dozen of the 800 or so the bakery will make each day. Notice the hand behind the back, a habit from competition baking in which touching the dough you were scoring meant points off. Hanging out in the bakery was just part of the process, my seeing the bread in porduction. What began on Tuesday was the photography for the book, truly remarkable images from the amazing Deborah Jones (most of the chefs who have worked on these books preface her name that way). And what happens for Deborah is pretty amazing, a real production requiring many people and rigorous organization, particularly given that what was being photographed was bread dough. Bread dough cannot be rushed and it waits for no one. 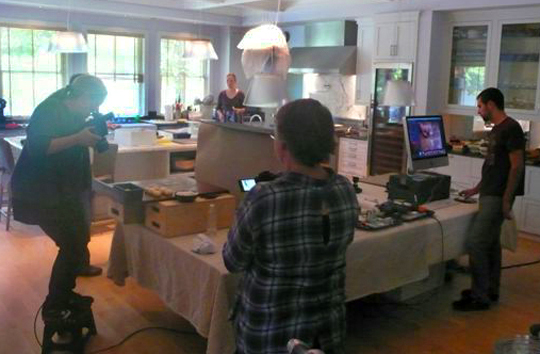 Most photography happens in Susie's kitchen; here Deborah shoots some shaped rolls; her camera is tethered to the iMac scrutinized by her assistant Josh. Susie is shooting video of Deb, and I'm shooting Susie. A multimedia world. 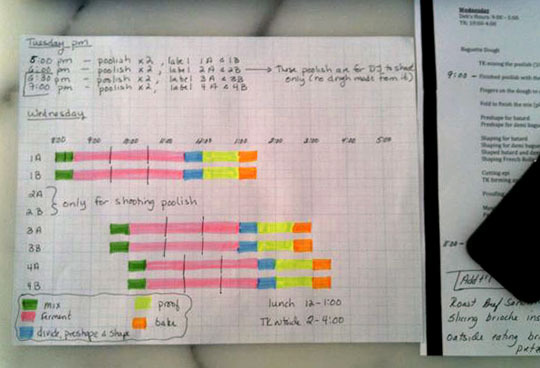 Amy Vogler is heroic in her organization and has mapped out times for the mixing, fermenting, proofing times for all the doughs so that they'll be ready to photograph. Chef Matt demonstrates a single-strand braid with a brioche dough; one of the goals Deborah is aiming for is process shots that don't look or feel like process shots, images that are beautiful but also convey the information needed to reproduce each bread. Thomas Keller, without whom none of this would be happening, portions dough for the camera. The following are the books this team has made. The My Baking Addiction blog helps other improve their baking skills. Thomas Keller’s batters, mixes, sauces and more are sold through William Sonoma. Generally, I’m not a fan of mixes, because I want people to cook, but these are excellent, and harken back to the happy times when Chef Keller the boy would make boxed cake mix with his mom. I am beyond ecstatic for this book to come out, I’m such a bread whore. I just ate at Bouchon a few weeks ago and the bread that was coming out was amazing. Even better is the bakery is right next to the dining room. We got there a little early and they were still cooking, the whole square smelled of fresh bread. Amazing. Grammar and spelling are all updated. Thank you for the comments. Wow, Susie has one awesome kitchen! Thanks for sharing this part of the process, I have all the books this team has produced and, to me, they set the standard for quality information and beautiful images…it’s easy to see why with so many great people putting their hearts into them. So glad to read you’re working with Susie again. She is best buds with my old next door neighbor Marie from my Rocky River days. I have great respect for her any project she graces! Michael I think Andrew is looking for an editing job :)) just kidding Andrew but in all of the interesting content of this post I didn’t see one error until u pointed it out…I, too, need an editor. Are those “portable” pastry boards/stones they are working on? One looks like wood, and Chef Keller’s, appears to be stone..
Can’t wait for the book to come out. I want your job Michael! they’re various boards susie has picked up, cool surfaces for photography. Ooooo, I’m excited about the book! Thanks for giving us a peek at the work being done to create it. Love the photos. Based upon the photos supplied in the blog post-and my 20plus years as a bread baker- I regret to inform you, and Sir Thomas, that the baguettes are scored improperly. The first score mark, and all preceding score marks, should be a straight line. It appears from the photo that the baker is making a common scoring error. The first score mark is below the median line of the bread; all subsequent scores start slightly above the preceding score and are always straight and never angled down. I learned this procedure from a master baker in France and after he repeatedly beat it into me. It’s a lesson I’ll never soon forget. Looking forward to the book. What is the cost of bread? It is priceless, since there are only very few bread bakers left. Salut. no, that’s pretty much how matt was scoring them, they way you describe. I’m having a hard time visualizing what you mean. Are you saying that the scores should run parallel to the length of the bread, not diagonal? When you say “straight and never angled down” do you mean straight as in not crooked or curved or straight as in not diagonal? 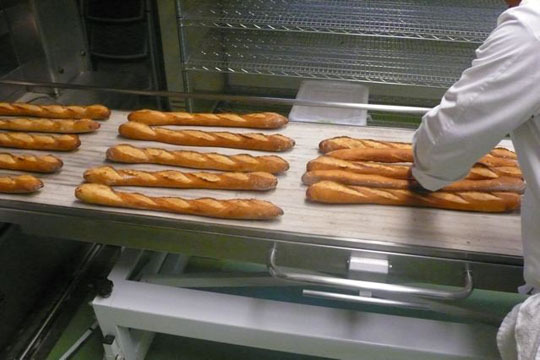 When I look at the baked baguettes, I see diagonal lines that are all parallel to each other, but are essentially what I would call “straight.” What are you seeing in the finished product that is incorrect and how does it affect the quality of the baguette? It’s freakin’ bread dude. Our ancestors have been doing it for thousands of years without needing such precision. Heck, my ancestors cooked it on rocks without the time to let it rise – leading to the most colon unfriendly holiday on the calendar. Where is that “eye rolling” Emoticon located? This brings me back to my days in the kitchens and I have to say the flashbacks aren’t always pretty… I hope the bread baking and book making is done with love ; ) I know you’ll do a wonderful job for your part. Hope you had fun in Yountville! The pictures were fine. Can’t wait to read the baking book. Sounds pretty intense. I know you’ll get the methods right. I cannot wait for this book, its not even funny (thank goodness I’ll be in Yountville in a few weeks!). Thanks for this wonderful behind-the-scenes look. I especially love your observation/appreciation of the Chef’s hand behind his back when he is scoring the baguettes. Just awesome. i once drove like mad one morning up to Bouchon from SF – ran inside, ordered about $20 worth of pastries…and ate them all myself. to the absolute horror of some of skinny girls. ha! come on cookbook! cant wait! As usual, I’m envious. That sure looks more fun than dealing with criminals, lawyers and judges all day. Thanks for giving us the behind-the-scenes glimpse. similar to working with criminals, actually, but a lot a more fun, yes. What a fun behind-the-scenes post. I just went to the Bouchon Bakery at Rockefeller Center and I’ll look forward to seeing the cookbook when it comes out. The brioche at Bouchon was terrific — I’m writing about it tonight. Thanks so much for the update! Some of us simply can’t wait to get our hands on this cookbook and getting updates makes it a tiny bit easier to wait :). While you wait, you might want to read “Tartine Bread.” It’s fascinating how they make bread without baker’s yeast. Can’t put it down. If you are in the Pacific zone, you might want to catch Michael Ruhlman on the Cleveland episode of No Reservations later today. Have both Tartine books. Haven’t had much luck getting the starting going for the bread book though I vowed try again when the temperature got warmer so it may be time. Sorry to get off the subject but I’m watching someone on the cooking channel on a show called Everyday Exotic “cure” pork belly by boiling it, no pink salt or rub, this chef needs to buy your book. Boiling the belly, wtf? I cannot wait for this book to come out. I didn’t realize Indulge wasn’t from the same group. hey can you tell me how can we increase the shelf life of Bread. I bake a lot of bread (poilane style), I’m glad you’re working on baking book. I have Tartine by Chad Roberston, it is a wonderful baking book. Forgive me if I missed the information in a previous post, but, when is the Bouchon Bakery cookbook due out? Any chance for a 2011 Holiday season release, or will we be waiting until Spring/Summer 2012? I have basically the same question as John. When will the book be released to the public? I am a baker living in Africa (currently on holiday in the US) and I would like to have someone get the book and ship it to me. If you could give some idea of the release date, I can have them look for it. Thanks so much.